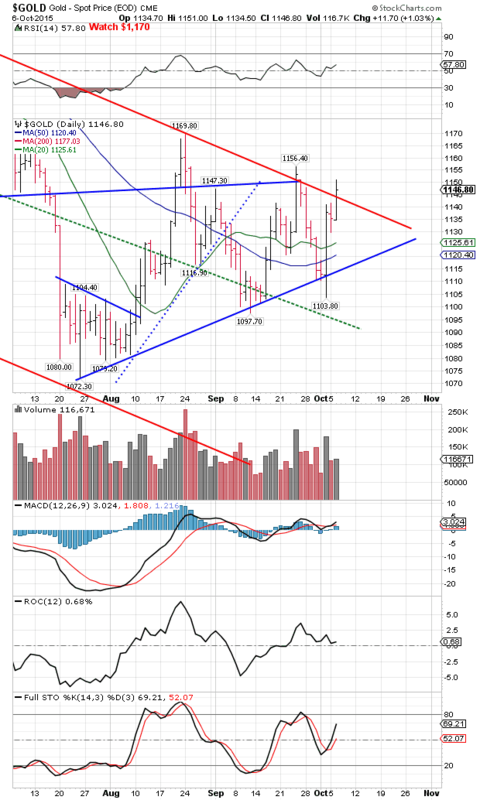 Gold and Silver Bull Market » Silver Price is Loose and Out of Her Cage and Raging! The GOLD PRICE took another run at that door today and busted it plumb down joining the party, shooting up today $8.70 or 0.76% to $1,146.80. The SILVER PRICE jumped another 27.7c or 1.76%, relentlessly to $15.979. This silver and GOLD PRICE party is heating up, I’m telling y’all. Better listen up. GOLD/SILVER RATIO today sank to 71.769, way below that uptrend line from July 14. It’s breaking DOWN, which means silver and gold will move UP. The gold price busted through that downtrend line from the January 2015 high. It traded to $1,151, but couldn’t push through $1,150. 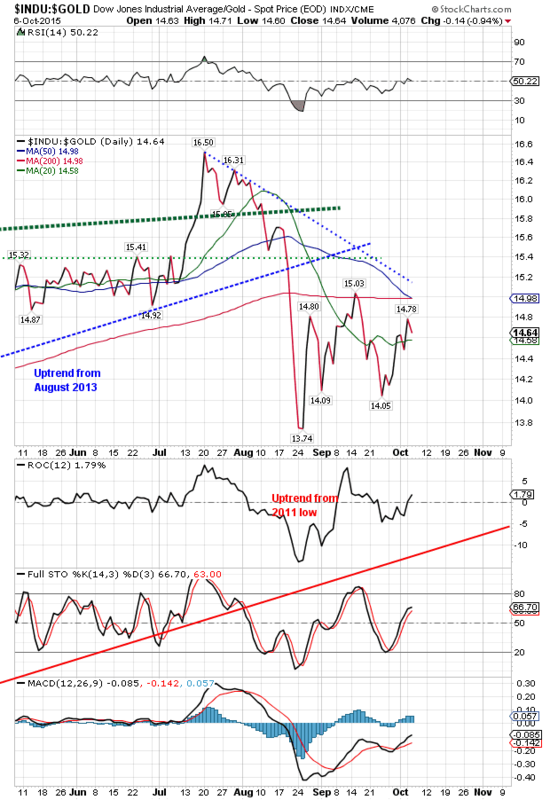 ‘Sokay, though, gold has taken the first step beating that downtrend. Hot stuff coming, y’all watch. SILVER the go-wheel here. LOOK, LOOK, at end of day silver closed above its 200 dma ($15.97). Traded up to $16.09 today, and kicked the snot out of resistance at $15.72. Next stop is $17.70. Y’all back off! Watch out! That silver is LOOSE, and out of her cage and raging! At the risk of repeating myself, I will say again, y’all better climb aboard this gold and silver train. Now to the nasty markets. The grim reaper, Reality, caught up with stocks today. Go to nasdaq.com and look at a chart of any index, and you’ll find them all laboring in heavy seas, trying without success to lift themselves up to the unchanged line. Dow alone gained 13.76 or 0.8% to 16,790.19. All other indices (I follow) fell. S&P500 dropped 7.13 (0.36%). Lowlife that I am, I will notice that the Dow alone pierced its 50 DMA, but barely. Others acted as if they were Superman and that 50 DMA was kryptonite. More or less to be expected. Next stop? 20th sub-basement. Dow in Gold closed down 0.9% at 14.65 oz. Fixin’ to drop more. Reality put on his stainless steel upper plate and took a bit out of the US dollar index, too. 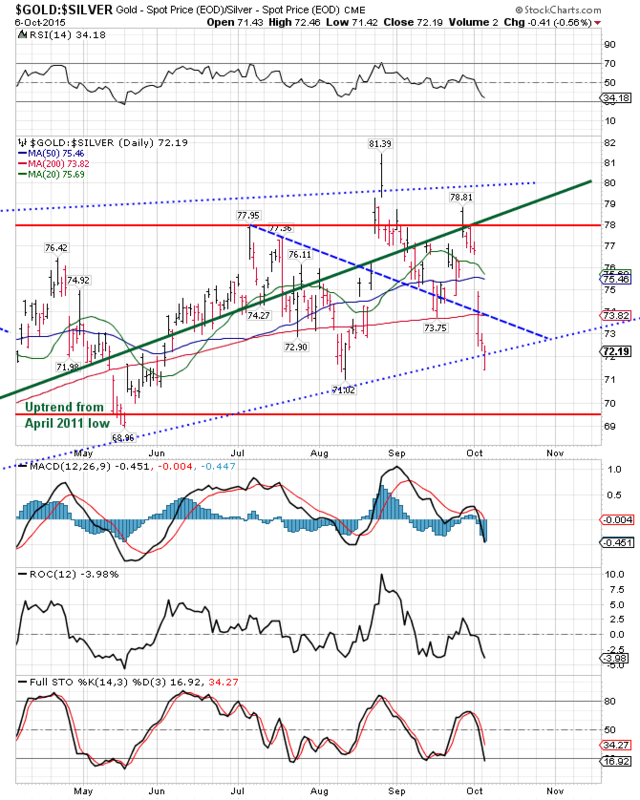 Dollar plunged 72 basis points (0.75%) to 95.51, I mean one single basis point above support. Hit a low at 95.40. Buzzards are circling: closed below the 200 dma (95.76) today. Will soon resume its sinking trajectory toward its intrinsic value: zero. Euro couldn’t work up too much gusto today, up 0.74% to $1.1272, but no breakout. Ditto the yen, up 0.19% to 83.19. In no particular order, here are observations I don’t want y’all to overlook. First time ever the US Treasury sold 3-month Treasury bills at zero percent yield today. Hell is full and the damned are walking the earth. Yankee government feels so sorry for having the hugest prison population in the world they’re fixing to turn loose 6,000 inmates convicted on drug charges. Bet they ain’t releasing anybody convicted on income tax charges. 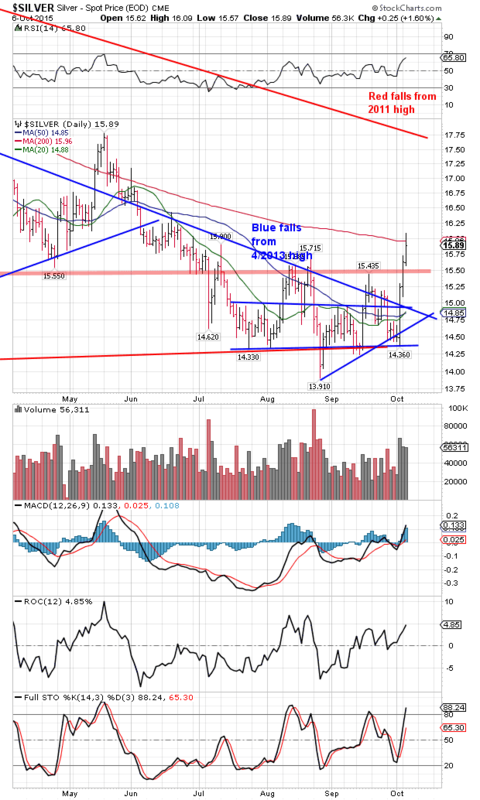 WTIC (proxy for oil) broke out upside from a pennant today. Genuine. What does that make of all that Fed drivel about no inflation? 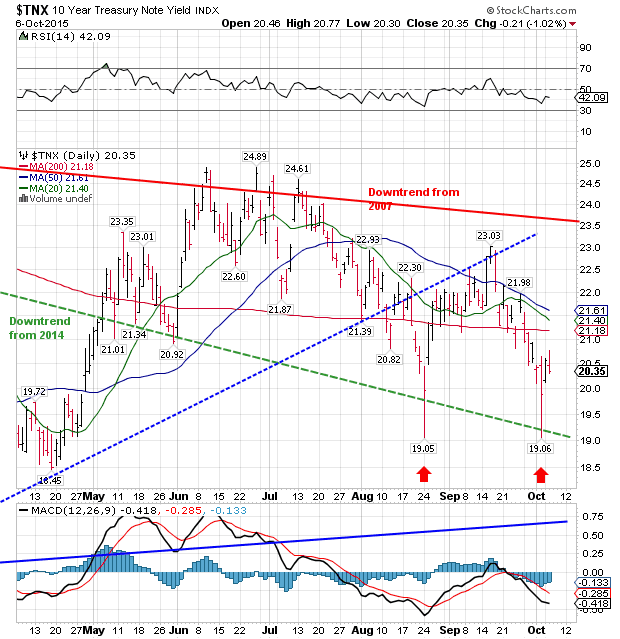 US 10 year treasury yield appears to have double bottomed. I know, I know, there’s that news item about 3 month treasury bills, but that’s probably a Top headline There’s a double bottom here at 1.905.